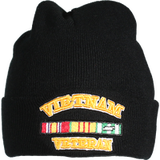 This warm, Black Vietnam Veteran Emblem winter hat is perfect for the warmer weather. Keeps your head warm during the coldest of winters. Black with direct embroidered text and ribbons.